Everyone needs a vacation sometime, but that doesn’t mean you have to get away from every aspect of your life. 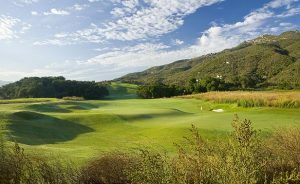 Grab your clubs and your lover, and head over to one of these resorts to just enjoy the golf and the company. You might get lost at this oasis in the desert, but not in a bad way. When you’re not on the 36-hole course, travel around the resort in a gondola on one of the many waterways. If you don’t mind the heat, this resort in Palm Desert a perfect spot for ultimate relaxation. You’ll feel right at home with the rest of the golfers here in Carlsbad. This course features great rolling hills all throughout the course. Pay tribute to Arnold Palmer as you drive balls all over a Palmer layout. Don’t drive it too far though, or you might lose your ball in the neighboring Batiquitos Lagoon. Here’s another desert resort, but this one has history. Originally founded by Desi Arnaz and Lucille Ball, this huge resort boasts two courses that make up 72 holes in total. By the time you’re done here, you might want to take a vacation from golf. When you’re not on the 7,000 yard golf course, spend some time at the tables and win some money so that you can come back to this Lakeside resort. Golf Digest rated Barona as a top five casino course in the entire country. I hope you enjoy a challenge, because with over 100 bunkers on the course, it leaves little space for error. Gambling, golf, and wine. Is there a better combination in the world? Head to this Temecula resort and just cycle through the course, the casino, and one of the many of the nearby wineries. Golf Week magazine ranks this 18-hole course as one of the best in the country. The third installment of our Palm Desert series, this resort was once the go-to spot for many Hollywood golfers. It has five separate layouts that add up to 90 holes. Who knows, maybe you’ll finally get your big break when you’re golfing here. This 50-year old course has hosted PGA events, and now you can get in on the action. After you spend all day on the 6,600 yard course, if your family is feeling neglected, make it up to them by taking them to the spa here in San Diego. Host of the Farmers Insurance Open, unleash your inner Tiger (get it?) as you attack all of the 36 holes. This resort sits in the beautiful coastal city of La Jolla. So when you’re not on the course enjoy the beach and the view. The course is split up into north and south sections, it is a total of 7,698 yards, so you can spend all day on the course. 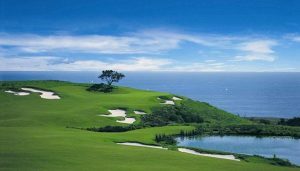 Get used to looking at the ocean, because you’ll be seeing it a lot at this course.. 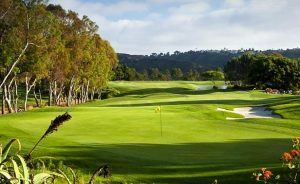 This Orange County resort has 36 holes that are constantly taunting you. It has two courses that can meet your every golfing need. Enjoy the view on the north course, and then get up close on the south course. Don’t fret too much about your bad shots here, because the ocean will always be there to calm you down and get you refocused. Pretty much everything I said about the last resort is true for this one. Except instead of 36 holes, this resort has 18 ready for you. Don’t worry, save all that time you would’ve spent on the other holes at the gorgeous pool. After outlining all these beautiful resorts, you might not see any articles from me for a while, because I’ve convinced myself I need a vacation too.